The New IRS Form 1023-EZ...Good Or Bad For Nonprofits? Guest column by Laura Hoehn, attorney with Trister, Ross, Schadler & Gold, PLLC in Washington, DC. On July 1, 2014, the Internal Revenue Service released a new three-page, online application ( Form 1023-EZ - "Streamlined Application for Recognition of Exemption") that it believes as many as 70% of applicants for 501(c)(3) tax exempt status may be eligible to use. Previously, all organizations - regardless of size - had to file the 26-page Form 1023, along with organizing documents and a detailed description of programs and financial data, before receiving a 501(c)(3) determination letter. Now, many small nonprofits (typically those with low actual or projected annual gross receipts) will be eligible to use the 1023-EZ. The number of 501(c)(3) organizations started to drop in 2011 when the IRS automatically revoked the status for thousands of nonprofits that failed to file annual returns. The new Form 1023-EZ may help reverse that trend. Why? It is much shorter and takes less time to complete. Because Form 1023-EZ is easier to review, the IRS says it can devote more attention to reducing the current backlog of 60,000 applications for 501(c)(3) exemption. Many small organizations that had their exemption automatically revoked can use Form 1023-EZ to apply for reinstatement. The new three-page form (Form 1023-EZ) asks for more general information and uses many check-boxes and yes-no answers compared to the original 26-page form (Form 1023) that requires more detail about the organization's past, present and planned activities. Organizations that use Form 1023-EZ may have done little to clearly describe their mission, programs and financial profile in writing, which may make them less prepared when approaching donors and asking for support. Previously, some of this work would have been required as part of the organization's tax exempt application. Form 1023-EZ is vastly simplified. While this makes the application easier to complete, donors and state charity regulators may be less confident that, under closer scrutiny, an organization that used this form is fully compliant with nonprofit requirements. 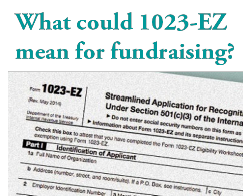 This could make future fundraising more challenging for those nonprofits that choose to file for their nonprofit status using the Form 1023-EZ. For more information, contact Laura Hoehn at (406) 219-3511. Laura Hoehn is an attorney who specializes in advising nonprofit organizations, foundations and donors. She is based in Bozeman, MT. Remember, there's more to grant writing than just "writing." Also remember, there's more to fundraising than just grants. And before you get started with fundraising, your nonprofit needs its tax-exempt status. If you're interested in learning more about the Form 1023-EZ and see who's weighing in, check out these resources. Send a message to start the conversation and learn how Laura Rhodes can help you and your organization.